Just regular folks. : I'm done. Kind of. Finished out the term today. Thank goodness. I was underprepared for the final - I could have used another 4 hours of focused study, but I think I'll be happy with the performance vs work ratio. Time is passing quickly - 5 out of the 8 semesters done. Even though it stresses me out, I'm enjoying it. I better be - I'm not going back another time to get a third college degree. This vocabulary word in Chinese means "typist". 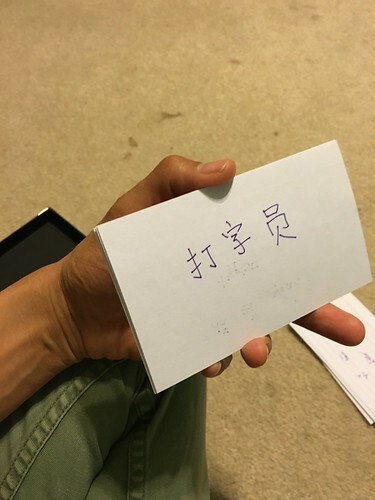 Vince had to learn the English word after learning the Chinese word. He's like what the heck is a typist. Very nice framing. And man do I want to wiggle now!